That still doesn’t guarantee that we’ll see the Samsung Galaxy A90 there, but it’s now looking very likely. And the Galaxy A90 probably won’t be alone, as the teaser for the event that you can see below shows three phones. We’ve also previously heard rumors of a Galaxy A70 and Galaxy A60, so they could be the phones set to join it, but nothing is known for sure yet. In any case, the Samsung Galaxy A90 is likely to be the most high-end and exciting model to launch. Rumors point to it having a camera that both pops up and rotates, so one camera setup can work for both sides of the phone and there’s no need for a bezel, notch or punch-hole at the top of the screen. And this doesn’t sound like it will be a single-lens affair, with rumors also talking of a triple-lens setup, including a 48MP main lens, an 8MP secondary one and a ToF (time-of-flight) depth sensor. 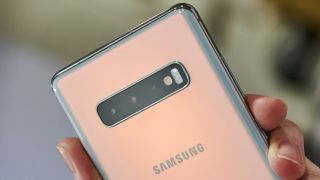 The Galaxy A90 might also have a 6.7-inch Full HD+ screen and a 3,700mAh battery, so it could make for an interesting alternative to the Samsung Galaxy S10 or Galaxy S10e. We’ll be reporting live from the April 10 event and will bring you all the news and announcements as they happen.